It’s not so long ago that a trip out for a drink in the open air meant venturing into the uncertain world of pubs with fibreglass tree houses and tables that acted like see-saws. These days - thankfully - things have improved somewhat, with pubs better equipped and more sophisticated – and a number of other choices for sipping back and enjoying a warm summer’s day or balmy evening. So we’ve taken a stroll through the patios and terraces as well as the gardens of pubs in our area to find out which are the best for visiting when it’s too hot to be indoors. The Bakers Arms near Swindon is probably as close as it is possible to get to the archetypal little, down-to-earth, country 'local'. And with a lovely pub garden to boot. This fantastic pub is set in beautiful countryside surroundings. This dog-friendly pub, is an ideal base for walking, cycling, golfing or just chilling out at any time of the year. At The Old Boathouse, you can enjoy all-day dining and drinking with views of the Water Park from their lakeside tables and outside decking. A 16th century thatched inn just a short drive east of Swindon with new decking, covered terrace & woodburning pizza oven perfect for the summer season. One of the most picturesque pubs in the UK. Brilliant when the sun's out and not half bad if you prefer the shade. The garden at Sally Pussey's is perfect for a summer pint or a bite to eat. If only all modern estate pubs were like the Tawny Owl. On the edge of Swindon’s huge northern expansion and only opened in 2003, the pub has surprising charm and elegance for such a young pub, and this is complemented by its smart patio. No wonder it was the first Swindon pub licensed to hold wedding ceremonies. > Woodlands Edge - info. A refreshing port of call in Sparcells, West Swindon. Plenty of seating and even views of the Peatmoor lagoon. Sports fans also love it when the big games are on with outside screens showing all the action. With its stunning location in the shadow of the ancient Halfpenny Bridge over the River Thames at Lechlade, The Riverside is not just popular with drinkers and diners but also ducks, swans and heron. Just the place for parking up your car or your boat and taking in the pub’s priceless atmosphere down by the riverside. The Trout is one of the area’s most picturesque pubs – both inside and out. In the summer the marquee is filled with the sound of music – famously jazz but also folk, blues and covers. 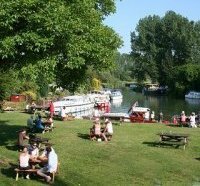 But probably the greatest attraction of all – especially after a stroll along the banks – is the pub garden that extends right down to the River Thames. The first pub on the Thames at Castle Eaton makes this another country pub well worth the drive or cycle-ride. Add in some very good cooking and riverside views and you almost have the perfect summer destination for drinking & eating. 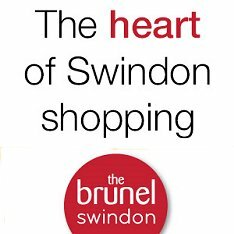 Yes, down by the river in Swindon town centre! The Runner, formerly the Running Horse, has a new terrace overlooking the meandering River Rey plus a big adjacent garden with children's play area. A hidden gem with its own real ale bar at the back of one of Old Town’s busiest venues. Good food as well + available for small private parties. We couldn't do a guide to Swindon's top places to enjoy a summer drink without including Mackenzies because it's been one of the best and most popular locations when the sun's out for over twenty years. Ideal as well come evening and night time with it's very own bar open 'til late. Now this is the Good Life when the sun's out! Back to its best after a major refurbishment - with more to come - The Clifton Hotel, just off Kings Hill, is the place to relax, enjoy a drink and catch up with friends. Always a delight on a bright sunny day, the 'secret terrace' at the back of The Plough is worth seeking out! A summer favourite since the 60s and still ideal for a lazy summer afternoon or evening drink. And for those who fancy a true taste of the continent, Rudis also serves tapas every evening. 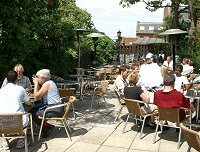 The GW's pub garden is a real sun-trap, perfect if you fancy a swifty before catching the train or a bus. The Weighbridge Brewhouse is open all day every day, and when it warms up there's no better place to enjoy a cool afternoon or evening drink than on their terrace. What we think is probably the best view in Swindon during the summer months - Stanton park and lake from the Stanton House Hotel terrace that overlooks it. Open from 10am-10pm serving drinks and food, and accessible from the park itself so walkers and dog-owners are welcome too. These are also highly recommended.